Less than 24 hours to the off, sailing enthusiasts are starting to arrive in Wicklow Town to get the first glimpse of the yachts that will set sail in the 2014 Round Ireland Yacht Race at 2pm tomorrow. 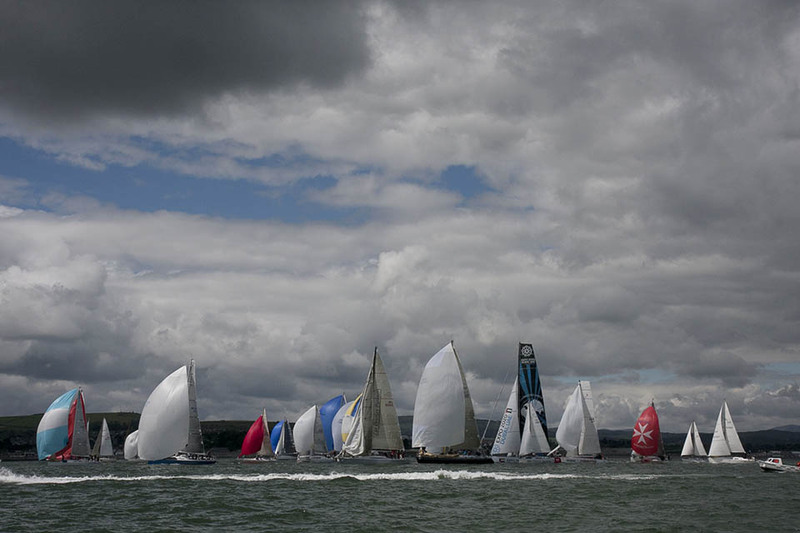 36 yachts (including 5 over 60ft) will raise their colourful sails for a tremendous spectacle as they line up for the race start. Thousands of visitors are set to descend on the seaside town of Wicklow over the weekend to see the yachts off and enjoy a spectacular 3-day sailing festival. The town and local chamber have come on board to put on a fine Wicklow welcome for the 300 sailors, their families and visitors with a spectacular Sailfest -: www.roundirelandsailfest.ie. Live music performances, pop up restaurants, an artisan market, children’s events, the Taste of Wicklow with 14 chefs including celebrity chefs Paul Kelly and Catherine Fulvio, fireworks on Friday evening and lots more. It is set to be a competitive Race with five yachts of 60 feet and over all competing to be first over the line in the 704 nautical mile contest. A spectacular air display from Newcastle Airfield featuring the world’s number 3 aerobatic stuntman – Eddie Goggins – will follow the departure of the Race over Wicklow Bay. Eddie will put on a tremendous performance in the Firefly and a Classic Piper Cub plane as well as a vintage Auster and an RV7 and RV6 plane will take part in the display. The Race is highly weather dependent and a change in wind means just about anything can happen, changing the outcome of the race right up until the last yachts cross the finish line.. Sailing enthusiasts can track the progress of the yachts at www.roundirelandyachtrace.com and can download a free app, which will give updates on the progress of the yachts every 15 minutes.